PHARMACEUTICALS AND HEALTHCARE: The whey forward! Emotional triggers!! The whey forward! Emotional triggers!! Interesting article on whey from this link: click here! Emotional triggers hold the key for sales. For example, consider a milk-mix beverage like Horlicks: when a person uses/buys the brand, he or she is emotionally triggered positively by the aroma, warm memories of the brand, taste, health benefits (such as strong bones or energy or boost to immunity), and other confidence generating features of the brand, and so on… It is the marketer’s challenge to create such emotional triggers in the marketed brand so that prospects are converted to customers, and customers stay with the brand. How to keep triggering the emotions to ensure successful purchase of the brand? Companies and brands need to ride with the trends to ensure they keep prospects & customers emotionally interested in the offerings. Positive emotions need to be generated by the brand – this keeps the brands fresh in minds of the target audience. Thus, more prospects get converted and the customer bandwagon keeps on increasing. Keeping with the contemporary trends by tweaking the brand messaging, packaging, creating line extensions etc, means the brand remains ceaselessly relevant to the customer. Trends should match the core benefit of the brand. All brand positioning and promotional activities are meant to strengthen the trust on the marketer’s brand(s). Pharma brands of the off-patent generics are successful in India, as they have won the trust of doctors (influencers) and patients. Trust and feel-good factor make the pen habits. Continuous product promotion to feed the trust and feel-good factor on the brand, reinforces pen habits of doctors. Today, a welter of conversations on pharma brands is sabotaging the success of pharma brands. It is the most CREATIVE OPPORTUNITY for pharma marketers to come out with campaigns to reinforce doctor’s pen habits and patient confidence. c) Value for money – this is the point that needs to be emphasized upon. It is time for pharma brands to talk on the brand attributes and service inputs, and justify the price for the brand. Justification of price comes through convincing communication to doctors and patients. For eg., when a patient buys brand A of paracetamol, the pack or strip or labeling or pack insert should reinforce the value of brand A: this can be done through reinforcing messages like: EACH SECOND SOMEONE SOMEWHERE - A PATIENT IS BUYING A TABLET OF BRAND A…trust Brand A. Today it is the time for brand reinforcing messages at level of patients also. For which, technology needs to be used. Let us focus on the 'whammo (b)', with high cost branded generics now being bandied as a bad idea for patient economics - so what is the way forward for the multitude of pharma companies ? A McKinsey report of Dec 2013 says, (even at that time 4 years back): the global VMHS (Vitamins, Minerals, Nutritional and herbal supplements) market was valued at 82 billion USD. EU, Japan and America are big nutraceutical markets. Electronic developments like the internet have caused the collapse of information float, creating the empowered patient and customer, who uses word-of-mouth and internet based knowledge for choosing health promoting products. There is an overall emphasis on preventative health (this is an important point for promoters of DENTAL CARE PRODUCTS). This is the opportunity that business models can bank on and recreate a positive pathway for business success. There are many nutraceutical concepts: polyphenol based formulations, health beverages, vitamin-mineral formulations, green tea concept (EGCG polyphenol)… and one can also see a WHEY FORWARD! Dairy industry: milk and milk derived products are traditionally popular in India. Lord Krishna was “maakhan chor” (he liked butter), and, in contemporary times, paneer (cottage cheese) is popular too for daily use. India is the largest producer of milk in the world. India accountsfor 9.5% of world’s production of milk! In 2015 – 2016 financial year, India produced 155.50 tonnes of milk. Milk offers an interesting culturally popular basis for nutraceuticals in India: whey, lactose, milk mineral concentrate, and milk proteins are part of the dairy industry products. Milk is a good source of protein containing 9 essential amino acids - 82% of milk protein is casein and remaining is serum whey protein (18%). The serum whey proteins do not contain phosphorous, this family of proteins contains subtypes like lactoglobulin, lactoferrin, alpha lact albumin etc. Whey is largely produced as a liquid offshoot of cheese production (upto 95%), and whey is also obtained when casein is produced (upto 5%). 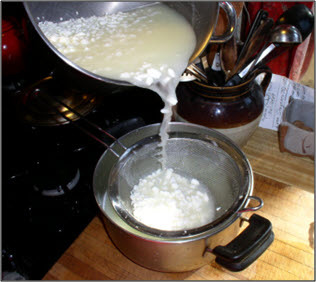 Whey is the liquid left over, after milk has been curdled and strained. Whey is incorporated into products of various categories: infant nutrition, sports nutrition, clinical and medical nutrition. The dominant type of whey production is in form of Whey Powder (WP) (about 70% of world production is WP, excluding lactose powder and permeate powder), and a fast growing type is Whey Protein Concentrate (WPC) – the latter has a protein concentration of 50 to 89%. The globally well accepted form of WPC is WPC 80 (ie., 80% protein). While WPC 80 is a popular form of whey protein - WPI (Whey Protein Isolate), also has high acceptance in milk based formulations. Lactose powder or milk sugar is a disaccharide – contains two sugar molecules (glucose + galactose). This milk derived product is used in infant formulae, animal feeds, for standardization of milk, pharmaceutical uses (diluent and for compressibility of tablets), confectionary and chocolate…Lactose (2 to 8% of milk) is extracted from whey. Milk mineral concentrate (MMC or milk calcium) is also derived from pasteurized whey. This form contains milk calcium and other minerals in optimal amounts: magnesium, phosphate, potassium, iron, copper, zinc, and vitamin D.
Milk permeate powder is derived from skimmed pasteurized cow’s milk and protein is extracted from this. Similarly there is whey permeate powder. So milk is not just about healthy taste, it is very much about offering well absorbed milk proteins for growth, development and immunity. WHERE ARE MILK PROTEIN PRODUCTS USED? D) Sports personnel, for muscle building and recovery from work-outs. Best of all, it is the unbeatable cultural acceptance of milk and milk-derived ingredients across India that makes this concept attractive. While there may be a shift from high cost branded generics to low cost branded and low cost unbranded generics - in the pharma market, a concomitant development will be a growing nutraceutical market in India. Indian pharma companies will surely weather this storm (in a tea cup?) and continue the winning streak through generics (formulations) and nutraceuticals in the global market. However, a word of caution: it is wise if policy makers tread with care when changing policies. And any policy change should be delivered with care…and the policy should not become a bull in a China shop. Emotional triggers are very vital for any purchase or prescribing decision. Emotional triggers need to be thoughtfully delivered. Milk and milk derived ingredients are culturally acceptable; hence, there is an emotional trigger in-built in this category. Similarly, herbs have good cultural acceptance and positive emotional appeal. Thus products designed with in-built emotional triggers is the whey forward!! Thanks for reading this blogpost, please read other posts by scrolling down, and click on older posts to read further; kindly recommend this blog to your acquaintances!